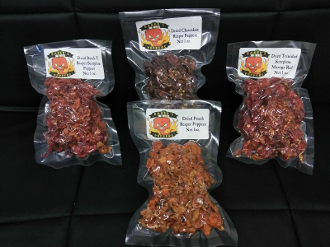 In this bundle we are going to include 4 individual 1oz packs of our famous GOURMET Dried Peppers! You will be shipped 4 packs and it will be ONE (1) pack of each of the following varieties....VERY LIMITED QUANTITIES! **Please purchase/consume at YOUR OWN RISK! !